One of the most basic product tasks is sending emails. No matter the interface or device; it can be a web product, a mobile product, TV product, wearable, API, etc. So your product will send an email to register new users, to restore passwords, shipping notifications, or any message that you need to send to users triggered by internal or external events. It’s very very common for a product send emails. In the market exists some alternatives to send emails that maybe your development team want to know. 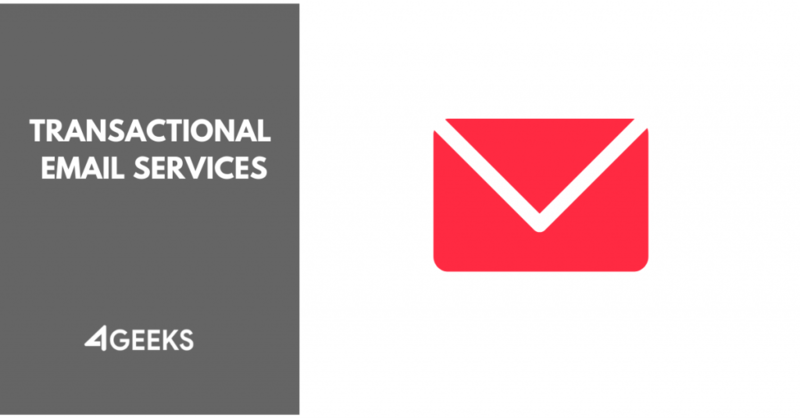 In the following 2-3 minutes I will mention the 3 main transactional email services to keep in mind. All of them are handled by their API and several software libraries to integrate with specific software languages. Mailgun is my favorite transactional email service because of their simplicity to setup and integrate. In Mailgun you can create sub-accounts, so you can use each sub-account for each domain with separate lists of email. 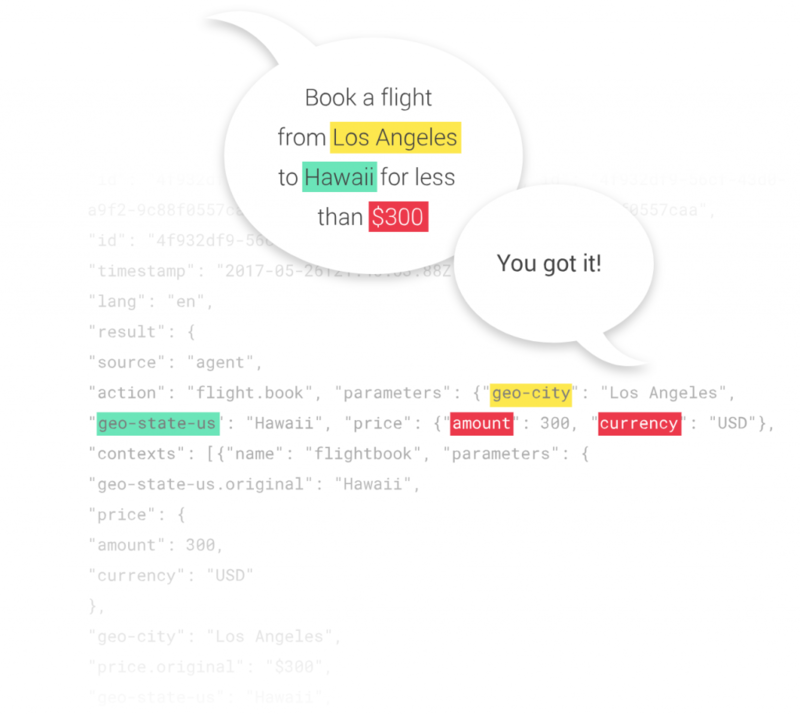 There’s batch sending features to personalize emails, detailed analytics, and logs, and a powerful parsing engine to turn incoming emails into JSON and route it where you want. Amazon Simple Email Service (Amazon SES) is a cloud-based email sending service designed to help digital marketers and application developers send marketing, notification, and transactional emails. You can use the SMTP interface or one of the AWS SDKs to integrate Amazon SES directly into your existing applications. With Amazon’s email offering, you’ll handle everything on your own. And it’s priced accordingly. There’s no plans to pick from, no tiered feature levels: just a flat fee of $0.10 per thousand emails you send, plus another $0.12 per GB of email attachments sent (up to a max of 10Mb per email message). If you send from an application hosted in Amazon EC2, the first 62,000 emails you send every month are free. Read more about this service in their website and learn how to integrate it with your product, examples codes and so. 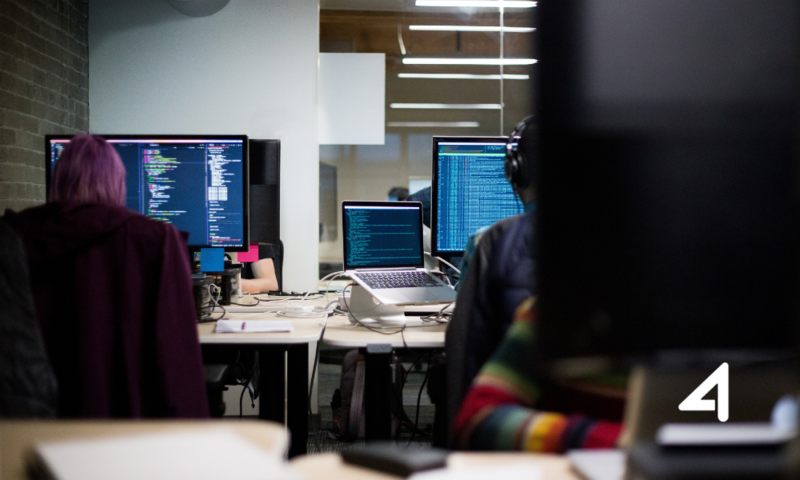 Sendgrid is one of the most popular email service that recently has been acquired by Twilio. Similar to Mailgun and AWS SES, you can use Sendgrid to send transactional email via SMTP or via API. Their API documentation is very complete. Sendgrid includes an user interface to let user compose, send and track marketing emails (and all in between). It includes to add contacts, create segments, create and send campaigns, and view your stats. Want to learn more? Check it out here. Ok. Hope you can find pure value on this post and you can keep in mind these email transactional services to use into your product… it’s useful to send shipping notifications, password recovery, and almost every stage you want to communicate to your users. Hi 4Geeks Nation!! 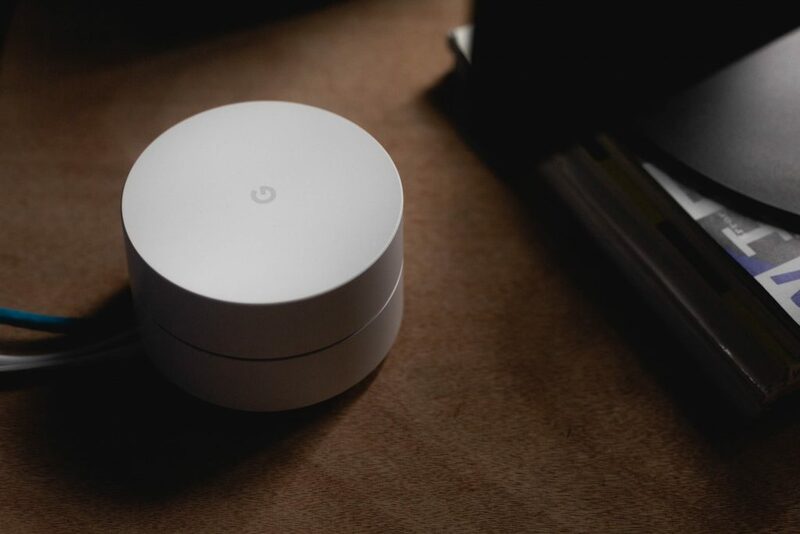 If you are behind a product development, specifically a mobile app, you want to know this new tool built by Google to send messages (notifications) to your users on your product. 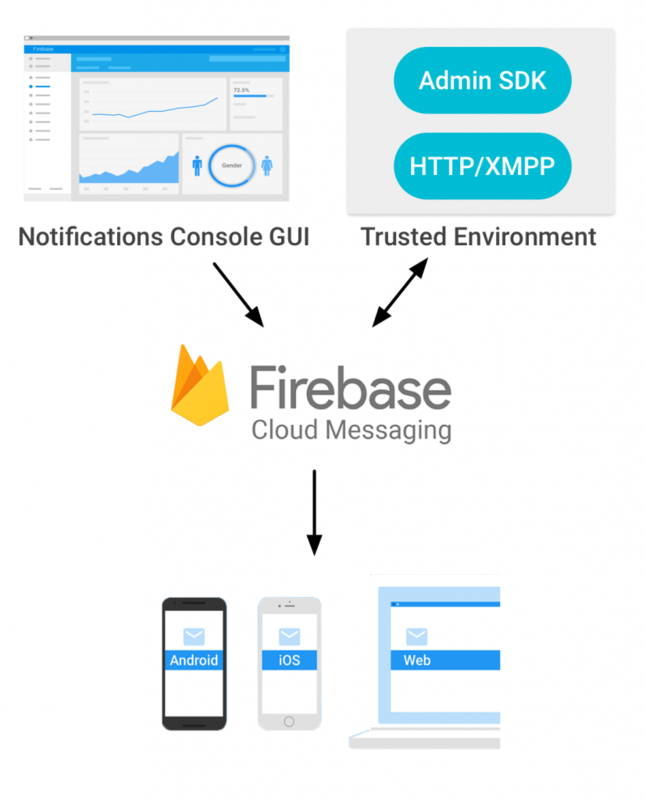 Google launched Firebase Cloud Messaging (FCM) as a new and more powerful tool to manage messaging to mobile devices. Look at the FCM schema… it’s beautiful and useful. 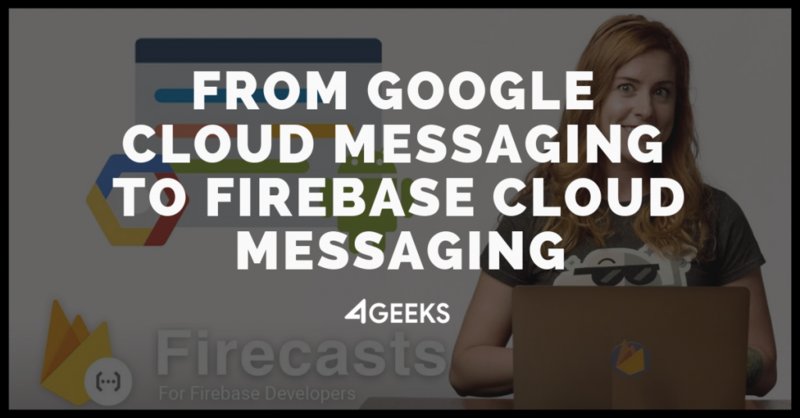 So, if you are using the old Google Cloud Messaging and planing to migrate to the new Firebase Cloud Messaging, this video can help you to put all factors on the table. If you need help with this, our software engineers can help you. So, contact us! 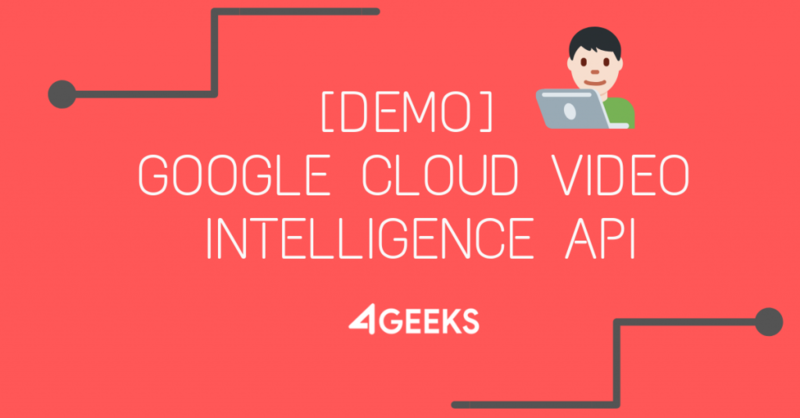 Some months ago Google showed to the world how to use their most recent video intelligence product, Google Cloud Video Intelligence API. Ok, to get context, Cloud Video Intelligence is basically an API that makes videos searchable, and discoverable, by extracting metadata with an easy to use REST API. You can now search every moment of every video file in your catalog. It quickly annotates videos stored in Google Cloud Storage, and helps you identify key entities (nouns) within your video; and when they occur within the video. Separate signals from noise, by retrieving relevant information within the entire video, shot-by-shot, -or per frame. Take a look at the following video to understand the power of this tool. If you working with videos, take your time to learn more about this API. If you are not working directly with videos, feel free to share this post with your boss… maybe it can be useful for next business strategies. Well, maybe Neural Network can be a fancy or very new term. 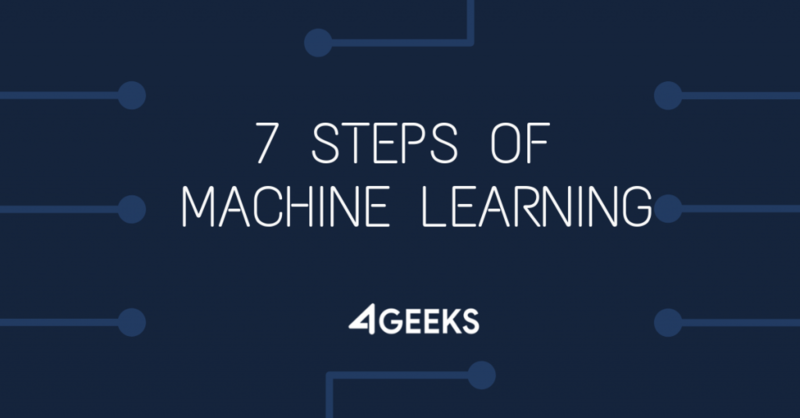 The thing is that Neural Network is the “base of” Machine Learning, and other applications like Artificial Intelligence. 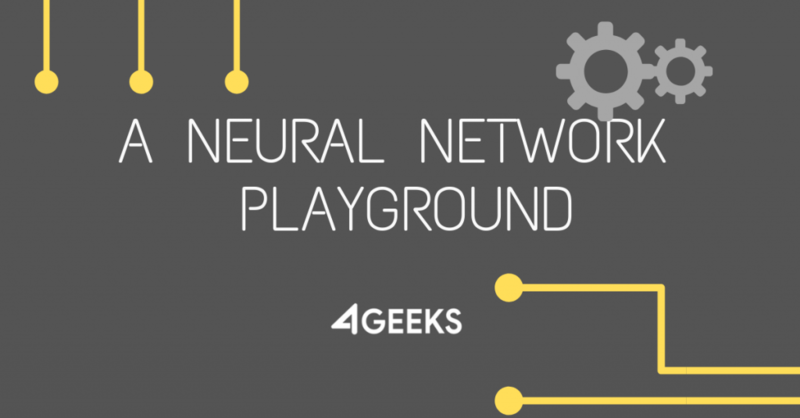 A Neural Network it’s a technique for building a computer program that learns from data. It is based very loosely on how we think the human brain works. First, a collection of software “neurons” are created and connected together, allowing them to send messages to each other. Next, the network is asked to solve a problem, which it attempts to do over and over, each time strengthening the connections that lead to success and diminishing those that lead to failure. 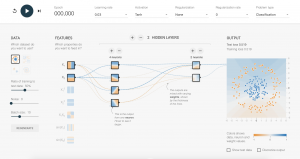 So, this web tool is an interactive visualization of neural networks, written in TypeScript using d3.js. Go to http://playground.tensorflow.org to start playing just in the browser. I tested it on Google Chrome. BTW, you can find the source here in TensorFlow’s GitHub. I would like to know if you are working on some Neural Network project. Maybe you can get the exposure needed 🙂 Use the comments section below. Guys, I want to share with you a blogpost from Google Cloud Blog, about a proof of concept on real-time diagnostics from nanopore DNA sequencers. In a healthcare setting, being able to access data quickly is vital. For example, a sepsis patient’s survival rate decreases by 4% for every hour we fail to diagnose the species causing the infection and and intervene with an appropriate antibiotic regimen. Typical genomic analyses are too slow. You transport DNA samples from the collection point to a centralized facility to be sequenced and analyzed in a batch process, which can take weeks or even months. Recently, nanopore DNA sequencers have become commercially available that stream raw signal-level data as they are collected and provide immediate access to them. However, processing the data in real-time remains challenging, requiring substantial compute and storage resources, as well as a dedicated bioinformatician. Not only is the process still too slow, it’s also failure-prone, expensive, and doesn’t scale. We recently built out a proof of concept for genomics researchers and bioinformatics developers that highlights the breadth and depth of Google Cloud’s data processing tools. 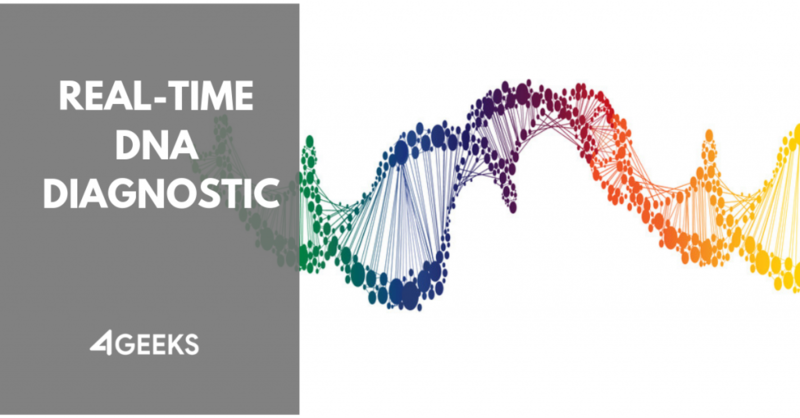 In this article we describe a scalable, reliable, and cost effective end-to-end pipeline for fast DNA sequence analysis built on Google Cloud and this new class of nanopore DNA sequencers. In all cases, analytical results are made available in a dynamic dashboard for immediate insight, decision-making, and action. 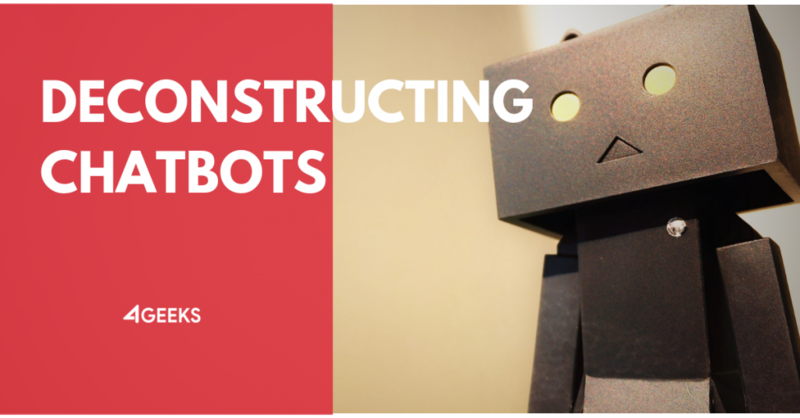 AI and Chatbots are trending topics nowadays, but some people don’t understand how terrific could be a chatbot in business. The following video shows how chatbots works, can they understand what humans says, and how they can response by using artificial intelligence. Is your business leveraging chatbots to support clients or maybe your business planing the next move? Take a look. Hello there! Today I want to put in perspective one of the most powerful tools of Cloud Computing on modern products. Any kind of product, any industry… it may be a SaaS or PaaS. If you already know what cloud storage is, good. But if don’t have idea what is it, let me explain you in a few words: Cloud storage is a cloud computing model in which data is stored on remote servers accessed from the internet. That’s it. And there are some excellent providers in the game like Amazon Web Services (AWS S3), Google Cloud Storage and Microsoft Azure Storage. One of my favorite cloud storage providers is Google Cloud Storage. Why? Listen to this podcast episode when I talked, with Sergio, about this service, pros and cons. Some popular services like Netflix, Uber, Coca-Cola, Spotify and Mall4G are storing a huge size of objects on cloud storage, keeping a good server performance and scaling as much they can. Benefit #1: Better product performance – auto CDN. More and more product owners are splitting assets (images, CSS, videos, fonts…) to upload it to a cloud storage service because they already how fast and secure is the content delivery rate. So, it means two advantages: don’t overcharge main servers and leveraging on a CDN (Content Delivery Network) to delivery objects to users browser or phone app. 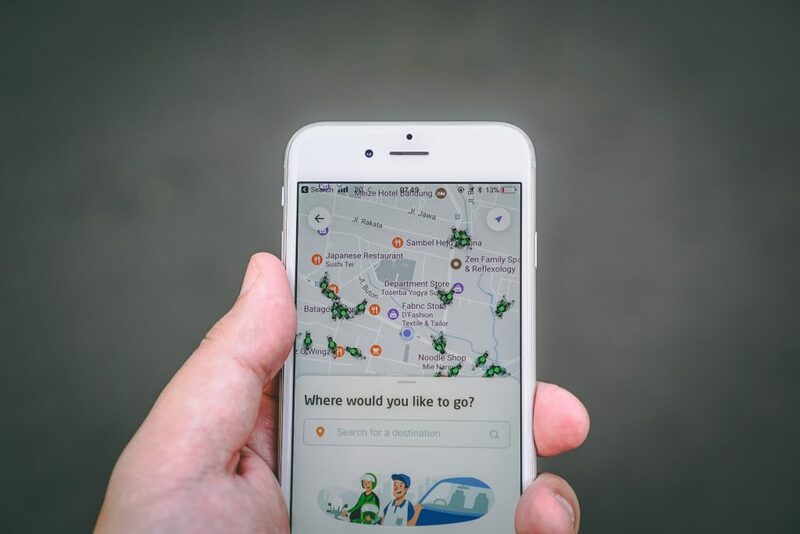 When the 4Geeks team integrated a storage service on Appetito24 (food delivery app), users in different regions automatically obtained an improvement in the mobile app and web administration panel: 65% faster. Here the map of Google Cloud Platform datacenter locations around the world. And here is the Amazon Web Services (AWS) and Microsoft Azure datacenter location around the world. This is one of the most important advantages of cloud storage, because the current providers have very competitive billing plans. The price may vary depending on the provider, but I can say that starts from $0.026 USD per Gigabyte per month. Now you can figure out the price to store a movie on a cloud storage service. Google, for example, offers a free quota of 5GB per month. I know some traditional companies, like Despacho Carvajal in Costa Rica, that are hosting its important docs, images and videos on a cloud storage service as its main backup plan. Store unlimited objects, 100% private (or public– you choose.). Google Cloud Storage, for example, can manage different versions of a single object; so it make possible to rollback as much you need to get a preview object version. This is so powerful. Founders know the power of scalability. Please imagine for a few seconds: Netflix uploads a movie one single time, and it can appears instantly on all TVs, computers, phones and tables around the globe. By magic. Security deserves a complete article, which I will publish soon for you. As always, if you need help to migrate your product assets to a cloud storage service, please feel free to pick a date to autogenerate an online meeting with me. Or if just looking for more information, write us at any time. The engineering team can assist you to take a good decision for your company.